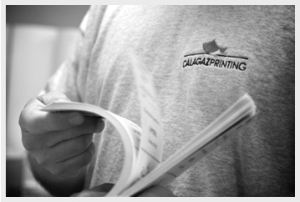 When you choose Calagaz Printing as your print provider we immediately become an extension of your company. Not simply “order takers”, our sales and customer service staff act as consultants, helping customers make informed decisions on every aspect of each project. We take ownership, making sure that your expectations are not only met… but exceeded. Calagaz Printing takes the time to ask consultative questions during the brainstorming process in order to bring your ideas to reality, and to help you get the most out of your marketing dollars.